Anyone out after midnight will notice the homeless people sleeping in doorways and on bus stop benches along Wilshire Boulevard – as well as in other nooks and crannies of the Miracle Mile. 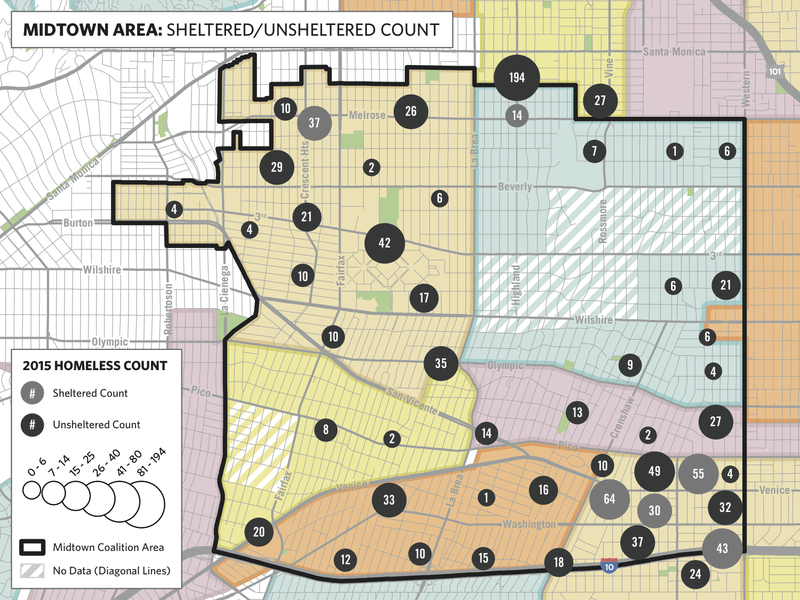 The 2015 Greater Los Angeles Homeless Count identified over 1,000 homeless individuals in the Midtown region of Los Angeles – most of them unsheltered [see map above]. A new group has formed to address chronic homelessness in the area: the Midtown Los Angeles Homeless Coalition. Led by Scott Epstein, Chair of the Mid City West Community Council, the group includes representatives from government agencies, neighborhood and business groups, and social service providers. Its goal is to decrease the number of people living on the streets by assessing their needs and connecting them with existing housing resources. The coalition is supporting the implementation of the county-wide Coordinated Entry System, which matches chronically homeless individuals with permanent supportive housing. Studies have shown that a Housing First approach is the most effective way to help people experiencing homelessness. It also saves taxpayers money through reduced law enforcement and emergency health costs. This entry was posted in News and tagged Coordinated Entry System, Greater Los Angeles Homeless Count, homeless, homelessness, Housing First, Mid City West Community Council, Midtown Los Angeles, Midtown Los Angeles Homeless Coalition, miracle mile, Miracle Mile Residential Association, mmra, Scott Epstein, Wilshire Boulevard. Bookmark the permalink.